June 2016 – Page 96 – Welcome to Wyandotte Daily! Health advocates have a simple message for parents: Don’t share a bed with your baby. Unfortunately, it’s a message some Kansas parents aren’t taking to heart. This year, seven infants in Sedgwick County have died while sleeping in a bed with their parents, a practice that can lead to suffocation. That’s equal to the bed-sharing deaths in Wichita for all of 2015. Three infants in Leavenworth County also have died this year while sharing a bed with their parents. “What I’ve learned from the parents I’ve talked to is they just never thought it could happen to them,” said Christy Schunn, executive director of the Kansas Infant Death and SIDS Network. Sharing a bed, or what Schunn calls “co-bedding,” doesn’t typically happen because the parents don’t have an extra bed. Instead, it’s more likely to result from parents’ exhaustion, drug or alcohol use, or misinformation about infant safety. Co-bedding has been championed by some infant care groups but rejected by the American Academy of Pediatrics, which released a study in 2014 showing bed sharing to be the greatest risk factor for sleep-related infant deaths. Co-bedding shouldn’t be confused with “co-sleeping,” the practice of sleeping in the same room with an infant, which is recommended by the American Academy of Pediatrics. Health experts recommend that infants should sleep alone in a crib without blankets. Schunn said the State Child Death Review Board of Kansas is examining the co-bedding deaths to better understand how they occurred, and whether they might provide lessons to guide prevention strategies. A Chevy truck rear-ended a Ford Focus on I-435 northbound near State Avenue about 5:36 p.m. Tuesday, May 31. According to a Kansas Highway Patrol report, a 2-year-old girl riding in the Focus was taken to the hospital. The driver of the Focus, a 39-year-old woman from Carrollton, Texas, had a possible injury and was taken to the hospital, the trooper’s report stated. The driver of the truck, a 19-year-old Raytown, Mo., man, was not injured, the report stated. Look for temperatures to rise to the low 80s today, with no precipitation in the forecast, according to the National Weather Service. While it is possible for a few showers and storms Friday night into Saturday morning, no severe weather is expected at this time, according to the weather service. 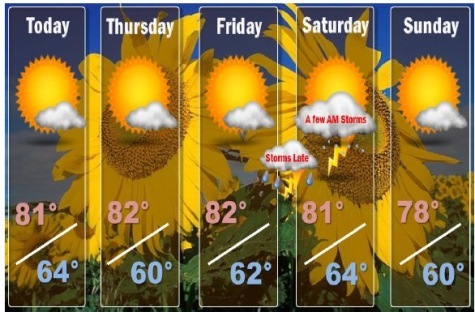 Otherwise, typical June temperatures are expected through the end of the week and into the weekend, the weather service said. Today’s forecast is sunny with a high near 80 and a north wind of 5 to 7 mph, according to the weather service. Tonight, expect a low of 60 with a north wind of 3 to 6 mph, the weather service said. Thursday, the high will be near 81 with mostly sunny skies and an east southeast wind of 3 to 6 mph, according to the weather service. Thursday night, the low will be around 61. Friday, expect mostly sunny skies with a high near 82, the weather service said, and a south southeast wind of 3 to 8 mph. Friday night, there will be a 30 percent chance of showers and thunderstorms, according to the weather service. The low will be around 64. Less than an inch of rain is expected. Saturday, it will be sunny with a high near 81, the weather service said.